A view of a traceried gothic window at Scot’s Church on Collins Street in central Melbourne. Above the window, an arcade of lancet arches lines the gable. A number of other slender lancet windows and examples of decorative blind tracery are visible. Scot’s Church was built in a decorated Gothic Revival style to the design of architectural firm Reed & Barnes. It is constructed from Barrabool Hills freestone with sandstone dressings sourced from New Zealand. The current Scot’s Church building was completed in 1874 and replaced an older church that had operated from the site since 1841. The site was granted to the Church of Scotland in 1839, and transferred to the Presbyterian Church of Victoria upon its formation in 1859 (when the Church of Scotland, the United Presbyterian Church and the Free Church united). 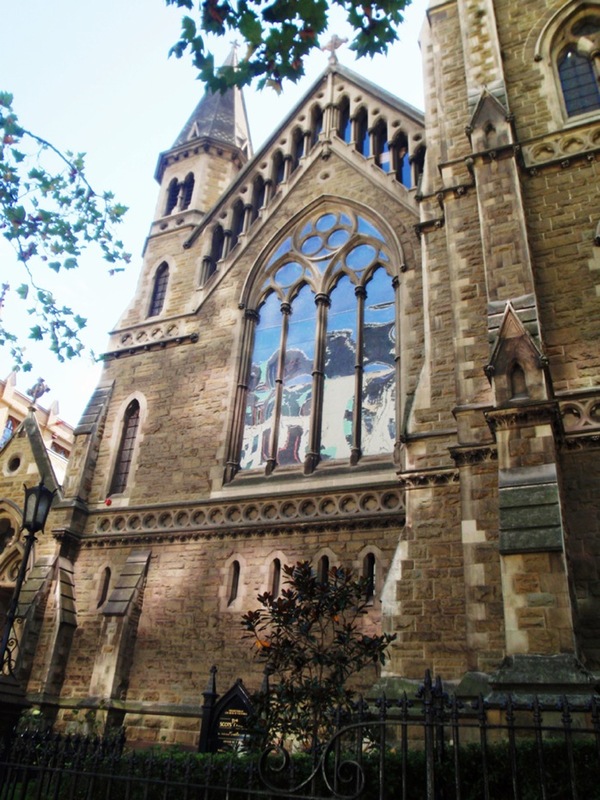 Other characteristic neo-gothic features of Scot’s Church include its 120ft spire, which for a number of years was the highest point in Melbourne’s townscape, its decorative quoins, buttresses, and pinnacles. The church also boasts a number of stained glass windows by well-known artists such as Ferguson & Urie of Melbourne, Van der poorten of Brussels and F.X. Zettler of Munich. 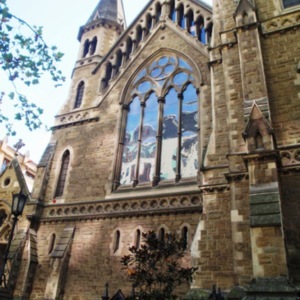 “Scot’s Church Neo-Gothic Window, Melbourne, Victoria,” Medievalism in Australian Cultural Memory, accessed April 25, 2019, http://ausmed.arts.uwa.edu.au/items/show/937.